The Soul Vibe, winner of the Guitar World Platinum Award, is back with a new look that really suits the "vibe" of this delicious pedal. Countless guitarists claim that Soul Vibe is the most convincing of analog rotary simulators, delivering on that Leslie experience complete with slight pitch changes as the horn comes and goes. Now Soul Vibe looks as sweet as it sounds. Check out that delicious root beer metallic finish, inspired by the warm, wood finished cabinet of a Leslie. Cr¨me brownface amp knobs are the perfect complement, adding to the visual warmth, while the matching cr¨me logo script puts this gorgeous new Soul Vibe in a class all its own. Just imagine plugging into this pedal and doing your best Gilmour or Trower licks. Yeah, we thought you'd like that. 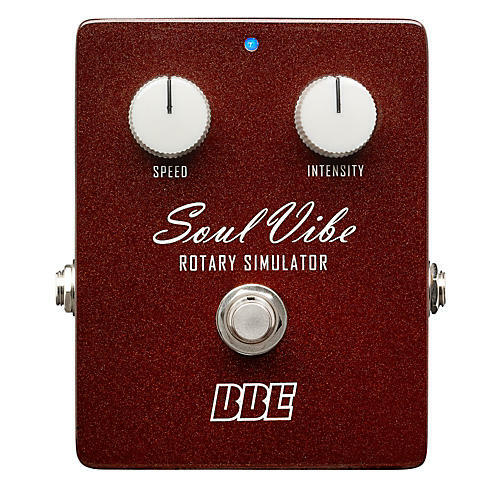 What hasn't changed is the Soul Vibe's commitment to an authentic rotary experience with the convenience, reliability and durability you've come to expect from BBE, including 1% metal-film resistors and true hardwire bypass. If rotary is your vibe, get a Soul Vibe and discover that heaven is still in heavy rotation. IT IS THE SOLE RESPONSIBILITY OF THE END USER TO PROVIDE THE BILL OF SALE OR OTHER MEANS OF PROOF OF PURCHASE TO VALIDATE THE WARRANTY IF WARRANTY SERVICE IS REQUIRED. BBE Sound, Inc. products are warranted against defects in material and workmanship for a period of five (5) years from date of purchase from BBE Sound, Inc. or an authorized dealer. BBE Sound, Inc. will pay return UPS shipping charges within USA. All charges related to non-US shipping, including customs clearance, will be billed. The warranty will be honored for the longer of either 90 days from the date of any service or the remainder of the original 5 year factory warranty. If a BBE Sound, Inc. product is purchased through an authorized BBE distributor outside the US, contact the distributor to arrange warranty repair. 1. The equipment has been physically damaged. 3. The equipment has been electrically damaged by improper connection or attempted repair by the end user or third party. 4. The equipment has been modified without authorization. 5. The bill of sale indicates that the purchase date of the equipment is not within the warranty period. A copy of the original sales receipt must be provided for service under this warranty. All non-warranty repairs are warranted for a period of 90 days from the date of service. BBE Sound, Inc. is NOT LIABLE FOR CONSEQUENTIAL DAMAGES. Should the unit fail to operate for any reason, our sole obligation is to repair the unit as described above.